The British, by contrast, brought tangible development, ports and railways, that created the basis for a modern state. More important, they brought the framework for parliamentary democracy that Indians, who already possessed indigenous traditions of heterodoxy and pluralism, were able to fit to their own needs. Indeed, the very Hindu pantheon, with its many gods rather than one, works toward the realization that competing truths are what enable freedom. Thus, the British, despite all their flaws, advanced an ideal of Indian greatness. (via India’s New Face – The Atlantic (April 2009). The Master's Anticipation - Rubbing hands in glee, aren't we? from The Daily Mail dated 25th February. 1946. The British Government apparently did not let the media in London onto the action by the Indian Navy on18th February, in 1946. (Artist: Illingworth, Leslie Gilbert, 1902-1979). Courtesy - cairsweb.llgc.org.uk; Click for larger image. At the end of WWII, Britain was a superpower, its huge colonial Empire intact – apart from the massive debt that it owed the US. With Germany defeated and Hitler dead, Italy in shambles and Mussolini hanged, Britain sat at the head of ‘high tables’ in the post-WWII world deciding the fate of the nations – with its partner in crime, the US of A. On February 18th, the ‘lowly’ Naval Ratings from the Royal Indian Navy rained on the British parade – by raising the flag of Indian Independence. Britain today, a shell of its former self – with its manufacturing hollowed out, its agriculture in shambles, its economy on the verge of being relegated to the Third World is a huge descent. Much like Spain after Haiti. In a 100 years after Haiti, Spain flamed out. By 1930, it was in the throes of a Civil War. And in Spain today, prostitution is national industry. India, in the meantime, led by men of straw, has moved from being a ‘ship-to-mouth’ basket-case, to a significant economic and political success. Yet, the British colonial administrators needed to prove that only they could rule over India. Indians were after all ‘men of straw … of whom no trace will be found after a few years’. And they were led by ‘half naked fakir‘. If Britain was indeed so good at its job, why can’t they do anything to save themselves from this terminal decline. For all this, we owe a debt of gratitude to the British? Next time Mr.Kaplan, can you make up a better story? Churchill very much wanted the option of squeezing the brown man at least a little more. Whatever little there was left of the brown man after the Great Bengal Famine of 1943. Clement Attlee pointed out that there was nothing left to squeeze. Attlee thought that the cost of squeezing was greater than the value of the extract. Colonial Indian armed forces took on the complacent Raj. Atlee appointed a Cabinet committee to finalize British departure after the Indian Navy put the British Empire on notice. This cartoon came in some 3 months after the Indian Navy's action. (Artist: Illingworth, Leslie Gilbert, 1902-1979; Published: Daily Mail, 14 May 1946. Cartoon courtesy - cartoons.ac.uk; Click for larger image. How can we ever repay this debt. Or the great benefit of English language. These stupid Germans, Italians, Japanese, Russians, French, Chinese – they don’t know what we know!! English is the universal language. All other super powers and developed countries (Japan, China, Russia, France, Germany, Italy) use their own languages. They could have been very successful (like India) if they had learnt English. I must admit, this small, little, disloyal question keeps raising its head, in my head? Why cant the British use that great English language to lift themselves from that terminal decline? What could the British do without captive markets and raw material sources? The British let all this go – so that Indian industry could survive. British business manager taught Indian businessmen how to run business competitively – and completely ignored their own business. Today, Britain has very few of the colonial era multinationals. Within 10 years of Indian independence, the British car industry started closing down. British coal mining became unviable within 15 years – and had to be shut finally. British Rail similarly collapsed. British capital goods industry (electrical, heavy machinery, electronics) went out of business. There is no British automotive industry worth talking about. British Steel faced with mounting losses, was nationalised within 20 years (Ratan Tata may revive British Steel and British Automotive segments finally). The Masters Anticipation - How about the British abdication of authority? Cartoon courtesy - cartoons.ac.uk; click for larger image. Hence, they did not kill us Indians in the numbers that they killed (more than 10 lakh Kenyans in 10 years) in the Mau Mau uprising. Or they did not torture and kill Indians the way they killed the Malaysians. Due to this reason, they also did not set up apartheid the way they did in Rhodesia (Zimbabwe) and South Africa. The other British legacy that we should be very grateful is our colonial bureaucracy. This colonial era bureaucracy, a permanent establishment, has been growing faster than our population – thrives by demonizing Indian politicians. Its corruption is aided by a myriad laws created by the same bureaucracy – for the benefit of Indians. In most states this bureaucracy takes up all the Governmental revenues and leaves nothing but tax increases for us. The Masters Anticipation - Arent we disappointed? (Artist - Illingworth, Leslie Gilbert, 1902-1979 Published - Daily Mail, 29 November 1946). Cartoon courtesy - cartoons.ac.uk. Click for larger image. The whole of black Africa has become a basket case. The people are ripped off by their rulers, in a far worse way than they ever were under white rule. Many of their citizens long for the return of white rule and the stability that would bring. It’s just a shame they are never going to get it. By this logic, the way Britain is being run, it will need to be governed by, guess who? Indians. Looking at where India was after the end of the Raj – and now, it is clear who is better at governing. Looking at the ‘decline’ of Britain (what will happen after the secession of Scotland and Wales?) and Spain, after the end of Black Moslem rule, and you know who should be ruling over Britain and Spain at least. As Britain (and the West) was forced out of various colonies, left behind was the garbage of colonialism. This post-colonial debris has become the ballast, that is dragging down many newly de-colonized countries. The Cyprus problem between Turkey, Greece and the Cypriots has been simmering for nearly 100 years. The role of the Anglo-Saxon Bloc, in Indonesia, the overthrow of Sukarno, installation of Suharto and finally the secession of East Timor is another excellent example. The many issues in the West Asia and Africa are living testimony to the British gift to the modern world. The entire Arab-Israeli-Palestinian conflict is a creation of the Anglo-French-American axis. An "anti-imperialist" cartoon, mocking Rudyard Kipling's White Man's Burden idea, published in the USA, during the Philippine-American War, as the US was itself preparing to compete with Europe as an imperialist force. Source - Originally from Life magazine, March 16, 1899. Click for larger image. Closer home is the Kashmir problem. After 60 years of negotiations, India-Pakistan relations have remained hostage to the Kashmir issue. If India’s new age regulators are anything to go by. Indian bureaucracy may be shedding its colonial paradigms. On April 1st, 1934, while the ‘Squeeze India’ campaign was under execution – choreographed by Montagu Norman, Neville Chamberlain, Winston Churchill (some sickness … some racism) Lord Willingdon, India’s banking authority was set up. The objective of setting up RBI – this colonial money authority, was to devise a policy structure for creating a ‘money famine’ needed by colonial British masters. From that April Fool’s day till now, RBI character has not changed. RBI resorts to creating these money famines every few years – even today. The last RBI ‘money famine’ in 1996 saw inter-corporate interest rates shoot to 40% – and a recession that lasted for 4 years. RBI remains isolated, out of touch with the India – and looks at India through colonial viewing glasses. The tragedy is that RBI is not alone. The IAS (a successor to the colonial ICS) and the Planning Commission are the other two. The IFS has been pre-occupied with diplomatically engaging the West, fixated with Pakistan, while India’s relations in neighbourhood are at a historic low. Compare that with the brilliant track record of modern Indian regulators and organizations like the SEBI, TRAI. Or even the IPS. India has the lowest prison population in the world – and also the lowest police-to-population ratio. Till 1990-95 Indian stock trading was largely done done through the open outcry system, physical paper settlements, long settlement periods – and rampant manipulation. Indian stock trading systems was a closed club – and did not attract any serious investors. Between, 1900-1995, SEBI, NSE, BSE and NSDL designed and managed the transition from the physical platform with the open outcry system to a complete electronic trading platform of the NSE and BSE. Today, the BSE/NSE trading system is the most advanced in the world – in terms of trade volumes, transaction volumes and automation. The NSE does more trades in a day than any other exchange in the world. Compared to the less than 20 lakh (2.0 million) trades on the NASDAQ, the NSE did nearly 70 lakh (7.0 million) transactions(on 3rd January 2008). The BSE (Mumbai Stock Exchange) has more than 6,000 companies listed – equaling NYSE and NASDAQ combined. All this when less than 5% of Indians are investors in equities. CB Bhave, who set up the dematerialised share repository, NSDL, revealed some interesting facts. The most interesting is that he felt the need to resign from the IAS – for things to happen. Bhave resigned from the IAS in 1996, to take up what was then seen as a rather low-profile job — to create India’s first share depository, even though he had the option of going there on deputation. “The job needed full-time commitment from me and from the team I was recruiting. How would I get it, if I did not burn my boats myself?” he says. (via Lunch with BS: C B Bhave). By 2000, India had less than 4 crore phones. Most of the 100 crore (1billion) Indians were unconnected – and disconnected from the world. Governments monopolies, BSNL and MTNL, ruled the roost. Pricing was based on scarcity – rather than any commercial costing or margin strategy. Mobile phone services had just been introduced – and were exorbitantly priced. Cell phones were status symbols, out of reach for ‘middle class’ Indians too. With low subscriber base and high prices, it seemed like the investments made in the mobile networks would have to be written off. TRAI, the telecom regulator was finding its feet – and being pulled in many directions by lobbyists. It looked like a classic vicious cycle – which could not be broken. 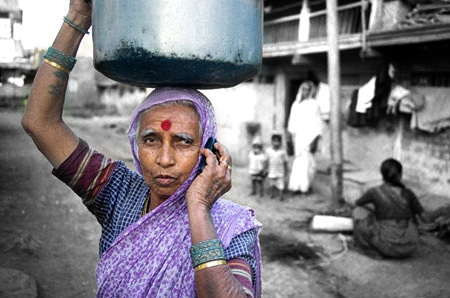 A Kolkata slum dweller with a mobile | Photograph: Jayanta Shaw/Reuters/Corbis; courtesy – guardian.co.uk, Wednesday 24 November 2010 11.22 GMT | Click for image. By 2001, the BJP led Government came to power. The telecom regulator in a series of bold moves, changed policies – and equations. Tariffs declined by nearly 5000% – from roughly 50 cents to 1 cent per minute. User base ballooned to 20 crores – from 4 crores. In 7 years more telecom users were added than in the previous 70 years. 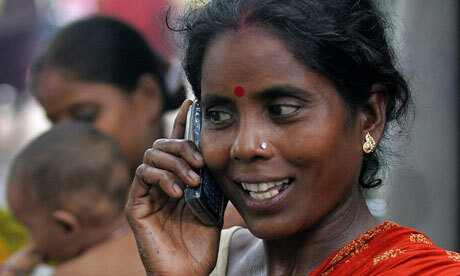 For the first time, the poor in India are beginning to benefit from technology. India today is one of the fastest growing markets – and one of the largest. It is dominated by profitable operators, providing possibly the lowest tariffs in the world. The next major test for TRAI is the phasing in the new slate of operators who have been granted licences. All this when just 20% of India is connected. After the boycott of the Simon Commission, from 1927, and the death of Lala Lajpat Rai, it was clear (especially to the British) that their days were numbered. Facing problems at home and abroad, the significant British interest in India was extraction of remaining wealth in Indian hands. A prime example of that was the railways. During WW2, nearly 40% rolling stock from India was diverted to the Middle East. More than 50% of the track system was the outdated metre gauge and narrow gauge. Track systems were nearly a century old. 40% of the railway system went to Pakistan. 32 of the forty-two separate railway systems operating in India, were owned by the former Indian princely states. So much for the British gift of railways to India. More than 8000 outdated steam engines were used as motive power – and less than 20 diesel locomotives were in use. Post Independent India continued with this practice – till LB Shastri called a halt to this. In 1956, the Madras-Tuticorin express plunged into a river when when a bridge at Ariyalur (Tamil Nadu) was washed away in floods. 144 (some records suggest 156) passengers died. He resigned from the Union Cabinet – claiming moral responsibility for the railway accident. This resignation saw LB Shastri become a political legend. This (resignation) also changed the mindset of the Indian Railways. After fresh elections of 1957, one year later, he was re-inducted into the Union Cabinet. Steadily, as railways infrastructure was upgraded, accidents decreased. 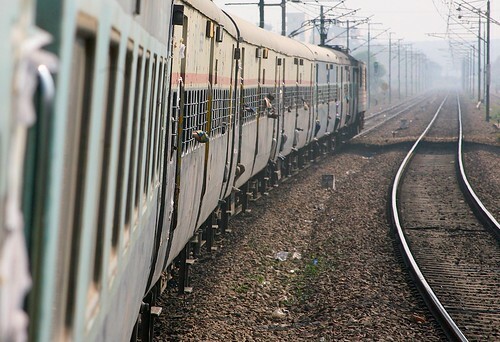 The de-colonization of Indian Railways began effectively in 1977 – 30 years after British departure. Symbolically, that was also the year that the Rail Museum was set up. The progress after that has been remarkable. Today for a US$5, an Indian can travel for a 1000 km. Unlike Indian Railways, RBI’s colonial paradigms are a drag on India – and is beyond redemption. The IAS, is too imperial for any use to India. The IAS with an overwhelming colonial bias towards creating a ‘compliance over-load’ on the back of every Indian has resulted in a Frankenstein of a corruption prone administration. Planning Commission’s signal failures over the years, in managing economic growth resulted in the Planning Commission being nearly disbanded in the 1991-95 period.